Download and print this Bible storybook to help children learn about God’s work of creation. This lesson is part of a series of Bible lessons about creation. Each PDF file tells the story of creation based on Genesis and includes color visuals. Use the links below to select the chapter you need. This resource was first used alongside a children’s church series about creation, but it could also be helpful in children’s Sunday school. When teaching younger children, it’s always helpful to have a visual. That is one reason why Bible story books are so handy for children’s ministry. On this page you can download a “Creation Story Book.” It would be a great help for teaching younger kids about God creating the world. There is a chapter for each day. 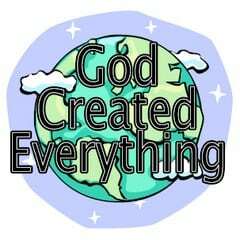 Here is a list of free materials for teaching children the story of creation. I love this and wants to be getting more for my church. Simply loving this site !!! Awesome material!. Very useful, thanks!.